Fairy dust, glitter and a little bubbly…no pun intended! 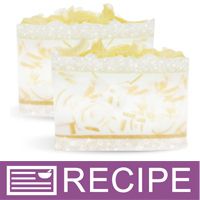 A dusting of sparkly color and a sprinkling of sweet aroma makes ordinary soap special. Kick off the New Year, celebrate a special occasion or just make a plain bath better. "This is my new best seller"
COMMENTS: I LOVE this kit!!! the fragrance is light and fruity, easy to make and now I have customers wanting to buy the whole block from me for wholesale orders! COMMENTS: This was a fiddle but well worth it. Love the look and the scent. Do plan to use the champagne fragrance with this look also. There are many variations to be had with this kit and its recipe. The scent with this is very delicate but perfect. The bars turn out better than they are in the picture. "Toast Up with this awesome soap"
COMMENTS: This is a best seller for me. It always sells out first! Your clients will love it and you can customize it to your liking to make sure it looks great! "Smells great and adds a little shimmer to you"
COMMENTS: This was a fun soap to make. It took a little more than just melting and pouring, but it turned out great. It's very popular with customers. Can't wait to order again. COMMENTS: This soap has been a big hit. Everyone tells me they do not want to use it because it looks so cool. Everyone loves the fairy dust scent! COMMENTS: This was an extremely easy recipe to follow and what a beautiful product. I wish I could submit a picture of my end product because it turned out absolutely beautiful. This is a favorite for my customers so I will be ordering this a lot! I'm so happy I initially ordered 2 kits!!!! COMMENTS: I don't think I've ever seen a more beautiful soap! I love these kits. I'm new to soap making, and these kits allow me to learn various techniques that I can use later in the designing of my own soaps. The Fairy Dust scent that comes with this kit is absolutely DIVINE!!! This is going to be a big seller, I just know it! "Do you sell the recipes without ordering the kits?" Staff Answer All of our recipes are available online free of charge! You may find recipes by going to the resource center at the bottom of our home page and selecting "Recipe Library". "At what step is the remaining fragrance oil and Vanilla Color Stabilizer used? I see #10 you use 1 teaspoon of the mixture." Staff Answer Checking down further in the recipe, you will add 22 mls. in Step #17 and 5 mls. in Step #21.